Tune in / Access our weekly schedule and archive / Visit our website! CKUT 90.3 FM is a non-profit, campus-community radio station based at McGill University. 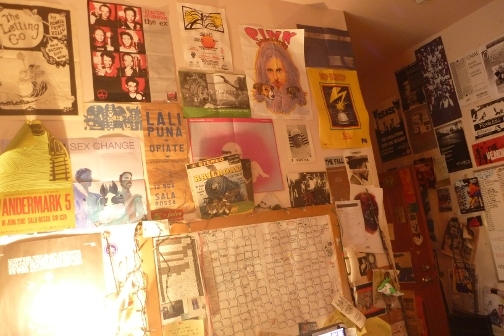 CKUT provides alternative music, news and spoken word programming to the city of Montreal and surrounding areas, 24 hours a day, 365 days a year. Hear us at 90.3 MHz on the FM dial, 91.7 by cable, or listen on-line. CKUT is made up of over 200 volunteers working with a staff of coordinators, not just to make creative and insightful radio programming, but also to manage the station. The station operates on a collective management system that includes volunteers in decision-making. Read More about CKUT 90.3 FM over here. This blog is co-authored by the CKUT music department staff and interns. We post about department news, projects and music we’re excited about on the regular. Want to get involved with CKUT’s Music Department? There are all kinds of ways you can contribute! CKUT is mandated to explore all kinds of musics and believes that artists often act as the emotional catharsis of our society and as such have a right to be heard. CKUT is not mandated to play what is known as TOP 40 music. Our objectives are to grant airtime to those who are not adequately served by the mainstream media – to provide a “voice for the voiceless” in addressing issues of concern in specific communities and to provide facilities and training through which members of the Montreal community and interested students may gain knowledge of and experience with radio programming, broadcasting and management. Check out our programming grid!! Find out more about CKUT right here! Wanna volunteer? Find out more about how to get involved.